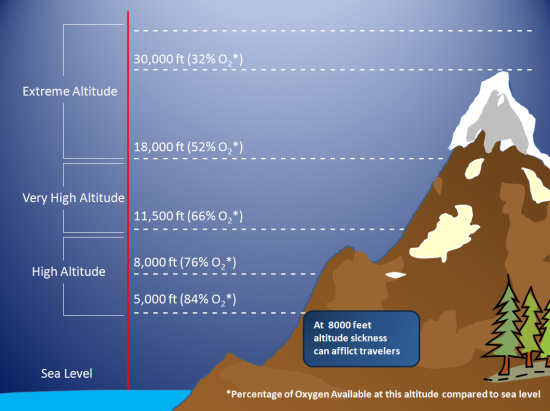 Don't die of altitude sickness! Every year, people die of altitude sickness. All of these deaths are preventable. If you are traveling above 8000 feet (2438 meters) read this information and tell your companions about it - it could save your life. 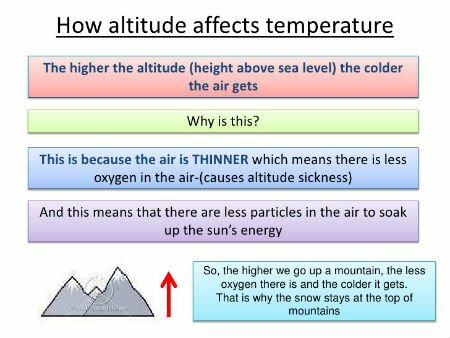 Altitude sickness is the name given to the human body’s physiological reactions that occur as a result of low oxygen pressure that exists at high altitudes. At higher elevations oxygen levels decrease. The problem of Acute Mountain Sickness starts when acclimatization does not keep pace with your ascent to high altitude. 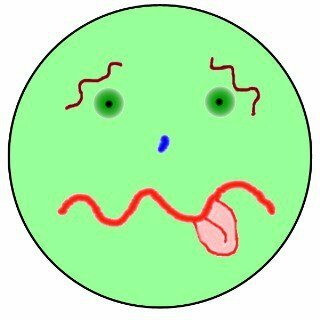 This happens when you ascend to quickly or go from sea level to high altitudes in a day and your body cannot get as much oxygen as it needs or is accustomed too. Even the top endurance athletes know to get to a high altitude race location a few days early to acclimate to the altitude. Call your health care provider if you have or had symptoms of acute mountain sickness, even if you felt better when you returned to a lower altitude. Climb down the mountain immediately and as safely as possible. If you plan on quickly climbing to a high altitude, ask your doctor about a medication called acetazolamide (Diamox). This drug helps your body get used to higher altitudes more quickly, and reduces minor symptoms. It should be taken the day before you climb, and then for the next 1 to 2 days. If you are at risk for a low red blood cell count (anemia), ask your doctor if an iron supplement is right for you. Anemia lowers the amount of oxygen in your blood. This makes you more likely to have mountain sickness. Don’t forget to think about Weather! The high country of the Rocky Mountains is noted for extreme weather patterns. Shaped by elevation, slope, and exposure, these patterns can change rapidly. Temperatures are often moderate at elevations below 9,400' (2,865 m). At higher points, like passes, it may snow at any time of year. A wide variation between day and nighttime temperatures is also typical of mountain weather. Daily rain showers are not uncommon at higher altitudes. Summer days in July and August often reach the 70's or 80's and drop into the 40's at night. All temperatures given are in Fahrenheit. You should automatically expect temperatures to be at least 10 to 15 degrees cooler in the higher elevations at any given time. Hikers should always be prepared for a wide range of temperatures and weather conditions while hiking in the Uinta or Wind River Mountains. Temperatures in the mountains typically fluctuate as weather patterns change, especially at the higher elevations. Some high passes have snowy spots throughout the year, but should be passable from late July through the month of August. High passes may start to accumulate new snow in September. August is the big month for backpack trips into the high country. Late July and early September can also be good. Some years October is dry and can be pleasant in the high mountains. But fall backpackers need to be extremely careful - harsh storms can arise in a hurry and trap campers.